isn't this a rather odd place for an outlet to be? I agree. this looks strange..
Is this an active railroad? or the end of a siding where a private car or a switch engine/rail-king might be parked? Wouldn't the wheels of trains and their carriages miss this arrangement? Provided there are no parts of the rolling stock that would actually be that low, I can't see a problem. But having said that, it does look weird. Is that a bunch of junction boxes next to that outlet? Sorry, my knowledge of railways gear is sadly lacking. I know what that is for. It is for the electric trains. But you should see the size of that extension cord! I've seen similar ... as well as all manner of stuff that you can't find at the local electrical ssupply house ... along RR tracks. All I can suppose is that the railroads have their own unique way of doing things ... remember, the NEC doesn't apply to rolling stock, track controls, etc. ... and there's an entire industry dedicated to serving the railroads. Sort of like the way the phone company once was. When you look at the way tracks are set, and the way the ballast (gravel) is compacted ... setting those boxed could not have been an easy job. BTW, there's plenty of clearenca between those boxes and any rolling stock. Truth be known, there's space between the railbed and the underside of the train for MOST people - if they can only avoid flinching as the train rolls over them! That definitely is an odd place for a Receptacle! Not 100% sure, but I may have the answer. 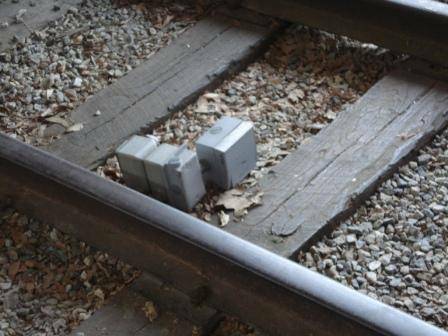 If this Track is located where Passenger (Commuter) Trains are "made-up", or stored temporarily - at the last Station of the Subdivision, then the Outlet may be for Temporary Power to the Passenger Cars while the Head-End Power from the Locomotive is not available. * Locomotive is shut down. The power is made available for Coach Maintenance (cleaning, etc.). Normally, the AC Power would be supplied from the "HEP" (Head-End Power) package in the Locomotive, via the Auxiliary Generator connected to either the Main Prime Mover, or the Auxiliary (HEP) Prime Mover. Only one point of connection would be needed, as the remaining Cars will be connected via M.U. Cables. A "Patch Cord" with (most likely) a Locking Plug on one end, and a Pin/Sleeve Cap on the other would be used to connect the Cars to the "Temporary AC Power". Here in Ireland the trains have a standard 230/400V 50Hz 3-phase system on board. Typically it's generated by a stand-alone generator (and a back up generator) in a generator van, or the driving van trailer in new push-pull sets. For some reason Irish Rail's never liked HEP being drawn from the locomotive. Most of the newest intercity (long distance high speed) fleet are now all DMUs anyway, so each coach generates its own power. There's a small generator under the floor. This provides the power for lighting, HVAC, on-board information systems and power outlets. If the generator fails, the other coaches can keep a 'dead' coach alive until the end of the trip. There are standard outlets in every coach for cleaning etc, in new trains at every seat for laptop power. These are just standard BS1363 metal clad outlets with an RCD (GFCI). Last edited by djk; 12/10/08 11:41 AM.